The Paper, “Cybernetics and Design: Conversations for Action” by Hugh Dubberly and Paul Pangaro starts with four basic tenets. If Design, then systems. If systems, then cybernetics. If cybernetics, then second-order cybernetics. If second-order cybernetics, then conversation. This paper would not be any fun, if I did not pick an alternative perspective. By considering an alternative perspective, I create space for a conversation. However, I have already undermined my argument. My argument is that, the notion of conversation, might equally be replaced with the notion of ‘tension’. Where conversation emphasizes 2 becoming 1. Tension emphasizes 1 becoming 2. This conversation we are having is about the nature of design; presumably about making design the best it can be and so we are from the outset engaged in the design of design. However, I am suggesting that an alternative view point is not that this division be understood as a conversation, but rather as a tension. The tension we have created here is through marking a distinction between design and designing. By creating this space, we face tension. That is, that an instance of designing will not fit with ‘design’, or that ‘design’ will not fit with it’s own activity. If this happens, we will become incoherent; and we will be forced to ‘choose’ a trajectory of definition. As we step, the ground is shaking beneath our feet. We experience this in our own cognition. When we take a step, we generate an expectation, and ’embody’ our expectation. Our possibility space stretches, creating tension, and narrows as we move toward embodiment. It narrows until we find a larger thread, which was pulling us to a new place of balance, which may lie 500 steps ahead of us, or back where we started but slightly healthier. Similarly, our perspective of design, whether it is ‘reducing tension’, or ‘engaging in conversation’, creates a possibility space for ‘designing’. What evidence might we choose for ‘selecting’ from these alternatives? Well, we can look to instances of ‘designing’ to substantiate either conversation or tension. In this case, one could make a case for both. This might be considered as a conversation, the beginning of an argumentation. Of course, if this is a conversation, then we have hardly designed anything. We have not created anything new. We have only ‘selected’ conversation; while the other side of argumentation fades into the ether. And thus, depicting this as a ‘conversation’ is self-negating. On the other hand, this design of design might be considered a tension. After all, here we are, torn between two possible articulations, two possible actions, which may result in different approaches, incoherent worlds. Of course, if we select ‘tension’, then our tension is hardly. We rest, assured, that design is a process of reducing tension, without any tension to speak of in the design of conversation. Our question is whether the coalescence of waves fragment the sea, or whether the fragmentation of the sea causes the waves. ‘Engaging multiple perspectives (in conversation), is a view from the waves down toward the depths; a suggestion that deeper, coherent patterns emerge from the movement of multiple waves.’ From this perspective, design is oriented toward ‘novelty’. Paradoxically, in this view, an actor incorporates an element of their environment (or their past), seeing patterns of patterns. Engaging with tension is a view from the depths; which sees patterns of waves, as the result of deeper potential differentiations. From this perspective, design is oriented toward ‘conservation’ (of potential). Paradoxically, in this view, design is achieved when an actor lets go of an element of their future (which is no longer necessary). In this, I am differentiating between an approach based on conversation, and an approach based on tension. For our design of design, an approach based on conversation would assess these two approaches, and seek to understand a manner in which they might co-operate. For instance, tension here is a resource for conversation from which new order might emerge. (Order from noise). Meanwhile, conversation (including articulation) is a means through which we surface tension. 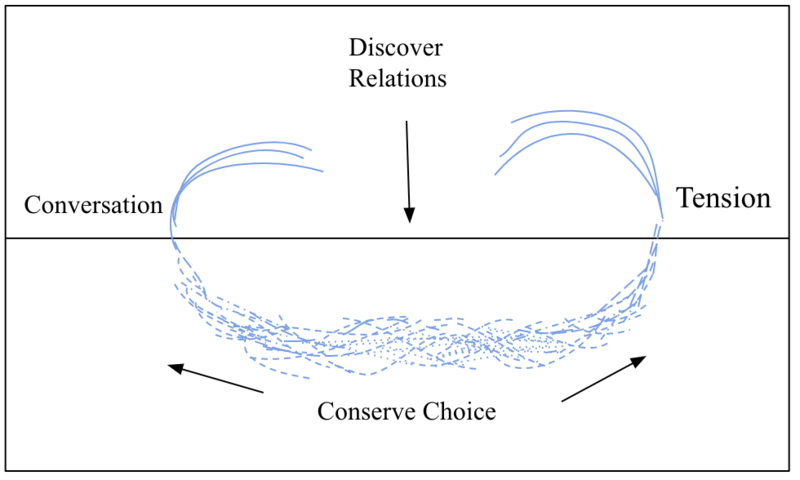 An approach based on tension asks if we need to ‘choose’. This draws us into ‘experience’, our true source of magic; a magic available before we ‘identify’ with one actuality or another. Here we experience ‘tension’, and ask ‘What is really at stake?’ Another way or saying this is that we become attune with ‘what matters’. Which relationships are we striving to maintain, and might they take new form? So, the distinction between conversation, and tension, matters to me, because they surface alternative subconscious associations. Conversation may facilitate experience. Tension is directly experienced. Design, as driven by the modern economy, is heavily oriented toward novelty, production, problem solving, and activity. Forwardness, creativity, progress, new technologies. Here we mix elements in novel ways. This is not to say that this is the intention of design as articulated by Dubberly and Pangaro. In fact, to the contrary, they state that “novelty is not the primary goal of design.” In fact, they argue, that it is rather an opportunity to ‘discover new goals and opportunities, and to co-construct shared frames’. In this sense, placing ‘tension’ at the center of design creates a semantic shift. Perhaps, because it is more explicitly directed toward the subconscious impulse; as with the distinction between ‘discover’ and ‘surface’, ‘co-construct’, and ‘co-articulate’. What is the stability against which Dubberly and Pangaro, differentiate ‘conversation’, while others differentiate ‘tension’. Surely ‘there’, or ‘here’ is some source of truth; which we aim to distinguish. As a society, going through large scale transition, toward a less intensive and production oriented manner of living, we ask, ‘how do our choices increase our demand for specialization?’ And ‘are we specializing without creating the capacity for conversation?’ What engines can we turn off, that is driving worlds apart? What is no longer necessary? If conversations, then perspectives. If perspectives, then decoherence. If decoherence, then tensions. If tensions, then potential balance. If balance, then conversations. In the cybernetic language. A distinction is the condition of an eigenform, and an eigenform the condition for distinction. In a later post, I will discuss tension mapping as an approach to design and conversation.